The aim of this multicentre, randomised, controlled crossover study was to determine the efficacy of adding continuous glucose monitoring (CGM) to insulin pump therapy (CSII) in type 1 diabetes. Children and adults (n = 153) on CSII with HbA1c 7.5–9.5% (58.5–80.3 mmol/mol) were randomised to (CGM) a Sensor On or Sensor Off arm for 6 months. After 4 months’ washout, participants crossed over to the other arm for 6 months. Paediatric and adult participants were separately electronically randomised through the case report form according to a predefined randomisation sequence in eight secondary and tertiary centres. The primary outcome was the difference in HbA1c levels between arms after 6 months. Seventy-seven participants were randomised to the On/Off sequence and 76 to the Off/On sequence; all were included in the primary analysis. The mean difference in HbA1c was –0.43% (–4.74 mmol/mol) in favour of the Sensor On arm (8.04% [64.34 mmol/mol] vs 8.47% [69.08 mmol/mol]; 95% CI −0.32%, −0.55% [−3.50, −6.01 mmol/mol]; p < 0.001). Following cessation of glucose sensing, HbA1c reverted to baseline levels. Less time was spent with sensor glucose <3.9 mmol/l during the Sensor On arm than in the Sensor Off arm (19 vs 31 min/day; p = 0.009). The mean number of daily boluses increased in the Sensor On arm (6.8 ± 2.5 vs 5.8 ± 1.9, p < 0.0001), together with the frequency of use of the temporary basal rate (0.75 ± 1.11 vs 0.26 ± 0.47, p < 0.0001) and manual insulin suspend (0.91 ± 1.25 vs 0.70 ± 0.75, p < 0.018) functions. Four vs two events of severe hypoglycaemia occurred in the Sensor On and Sensor Off arm, respectively (p = 0.40). Continuous glucose monitoring was associated with decreased HbA1c levels and time spent in hypoglycaemia in individuals with type 1 diabetes using CSII. More frequent self-adjustments of insulin therapy may have contributed to these effects. The study was funded by Medtronic International Trading Sarl Switzerland. 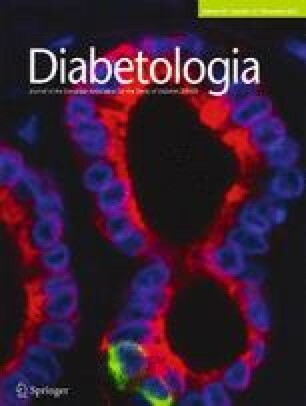 Near normoglycaemia is associated with a reduced risk of microvascular and macrovascular complications in type 1 diabetes but is difficult to achieve despite considerable effort from patients and healthcare providers; only a minority of patients achieve a HbA1c level within the target range [1, 2, 3]. The use of insulin pump therapy (CSII) reduces the HbA1c level without an increase in hypoglycaemia, compared with multiple daily insulin injections in meta-analyses [4, 5], and is recommended for the improvement of metabolic control . Continuous glucose monitoring (CGM) has also been associated, in various randomised controlled trials, with reductions in HbA1c [6, 7, 8] and time spent in hypoglycaemia [9, 10]. Sensor-augmented insulin pump therapy (SAP), combining CSII and CGM, was recently shown to significantly decrease HbA1c without an increase in hypoglycaemia in adults and children, compared with multiple daily injections, in two large multicentre trials [11, 12]. However, studies investigating whether SAP can further improve glycaemic control in patients with type 1 diabetes using CSII alone have yielded conflicting results [13, 14]. The present randomised, controlled, crossover study was therefore designed to determine whether patients with poorly controlled type 1 diabetes who are already using insulin pump therapy can achieve improved metabolic control with the addition of personal CGM, and to evaluate associated changes in insulin treatment patterns while using SAP. The study had a multicentre, randomised, controlled, crossover design. Participants were recruited at four adult and four paediatric sites in Europe with experience in the use of insulin pumps and CGM. Participants were included if they were aged between 6 and 70 years, had a type 1 diabetes duration of more than 1 year and a HbA1c level between 7.5% and 9.5% (58.5 and 80.3 mmol/mol). Adult participants were aged 19−70 years; paediatric participants were aged 6−18 years. In addition, eligible participants had been using CSII with rapid-acting insulin analogues for more than 6 months, were naive to CGM and had successfully completed a five-question multiple choice test concerning pump therapy and general understanding of diabetes . Exclusion criteria included ≥3 incidents of severe hypoglycaemia in the last 12 months, a history of hypoglycaemia unawareness (i.e. hypoglycemia without symptoms), concomitant chronic disease known to affect diabetes control and any pharmacological treatment that might modify glycaemic values. Participants were randomised to either a Sensor On/Sensor Off (On/Off) or a Sensor Off/Sensor On (Off/On) treatment sequence, in a 1:1 ratio. Randomisation was generated electronically through the electronic case report form according to a predefined randomisation sequence (implemented by a statistician). Paediatric and adult participants were randomised separately. Participants, study staff and investigators were not blinded to the HbA1c data. During a 1-month run-in phase, participants used a glucometer (Bayer Ascensia Contour; Bayer Diabetes Care, Basel, Switzerland) and an insulin pump system (MiniMed Paradigm REAL-Time System; Medtronic, Tolochenaz, Switzerland) able to integrate CGM in the study phase. All participants received structured training on diabetes management and device use and had their knowledge assessed, as previously described . Each treatment period was 6 months long, with a 4-month washout phase between the two periods. Study visits occurred every 6 weeks during the treatment periods, when the data from all devices were uploaded onto a computer system using diabetes management software (CareLink Therapy Management System for Diabetes-Clinical; Medtronic, Tolochenaz, Switzerland). There were no study visits during the washout period. All participants wore a continuous glucose monitor (Guardian REAL-Time Clinical; Medtronic, Tolochenaz, Switzerland), which they were blinded to (the device screen was turned off), for 2 weeks prior to randomisation and prior to crossover. Participants in the Sensor Off arm wore the device for 2 weeks prior to each study visit. No common treatment protocols or fixed algorithms were provided to the centres , and therapy adjustments were made in consultation with participants at clinic visits. Participants were individually encouraged to make self-adjustments to their treatment using real-time CGM values, hyper- and hypoglycaemic alerts and trends, or to incorporate self-monitoring of blood glucose (SMBG) results into treatment adjustments, with written examples of therapy changes provided in the optional patient diary. Participants completed a ten-question test to demonstrate technical knowledge on the pump (4 weeks before randomisation) and a 12-question test on CGM (at visit 1 of the On/Off sequence or visit 6 of the Off/On sequence). The primary endpoint was the difference in HbA1c levels between the Sensor On and Sensor Off arms after 6 months of follow-up, adjusting for baseline levels. Prespecified secondary endpoints included changes in glycaemic patterns, as expressed by mean 24 h glucose and 24 h AUC values, and changes in the time spent in hypoglycaemia (<3.9 mmol/l), hyperglycaemia (>10 mmol/l) and euglycaemia (3.9–10 mmol/l). Sensor data for the secondary endpoints were extracted from CareLink Clinical (CareLink Therapy Management System for Diabetes-Clinical, Medtronic, Tolochenaz, Switzerland) during the 15-day period prior to the end-of-period (6-month) visit. For the Sensor On arm, 100% sensor use was calculated as the number of days in the Sensor On period multiplied by 288, the maximum number of sensor readings per day. HbA1c was analysed by a central laboratory at screening, randomisation and at 3, 6, 10, 13 and 16 months using a Diabetes Control and Complication Trial-aligned HPLC method (Laboratorium für Klinische Forschung, Kiel, Germany). Data on adverse events were collected at each visit and the number of SMBG values <3.9 mmol/l were calculated from the glucose meter downloads for 15 days prior to the end of each period. Severe hypoglycaemia was defined as an episode requiring assistance from another person or neurological recovery in response to restoration of plasma glucose to normal. Ketoacidosis events were defined as episodes of hyperglycaemia (blood glucose >13.9 mmol/l) with low serum bicarbonate (<15 mmol/l), low pH (<7.3) or both, together with either ketonaemia or ketonuria, that required treatment in a healthcare facility. Patterns of insulin use (total insulin dose, relative proportions of basal and bolus doses, number of boluses and temporary basal rates, and use of basal suspend and bolus wizard features) during the 15 days prior to the end of each study period were analysed from the data uploaded from the insulin pumps. A sample size of 124 participants (62 randomised to sequence On/Off and 62 randomised to sequence Off/On) provided 90% power to detect a mean difference of 0.3% in the primary endpoint, assuming an SD of 1.0%, a two-tailed matched-pairs t test and a type I error of 5%. To account for the duration of the study and possible dropouts, the sample size was increased by approximately 20%, to 160 participants. The two groups were compared using an ANOVA with adjustment for period effect and subject as random effect. Period was included in the model regardless of statistical significance. The mean difference in HbA1c between the Sensor On and Sensor Off arms, with the corresponding 95% CI and p value, were estimated. Possible carry-over effects were minimised in the study design by using a 4-month washout period . The intention-to-treat (ITT) population consisted of all randomised participants, irrespective of their compliance with the planned course of treatment or deviations from the protocol. In the case of missing data, measurements from the same study period were carried forward to substitute for missing end-of-period values. If no measurements could be carried forward, the end-of-period data that were available for only one period were used to impute missing data in the other period. Secondary endpoints were compared using an ANOVA model similar to the one used for the analysis of the primary endpoint. Analyses were performed in the ITT population. All statistical analyses were performed using Statistical Analysis System (SAS), version 9.2 (SAS Institute, Cary, NC, USA), and p values <0.05 were considered statistically significant. The study protocol received institutional or national Ethics Committee approval at each of the study centres and the study was conducted in line with the Good Clinical Practice provisions of the Declaration of Helsinki with all amendments and local regulatory requirements. Written informed consent or assent was obtained from all participants before enrolment; parental consent was obtained for participants aged <18 years. Participant disposition is shown in Fig. 1. From January 2008 to July 2010, a total of 185 individuals were screened and 153 (52% male) were randomised after the run-in period; 77 were randomised to the On/Off sequence and 76 to the Off/On sequence. A total of 15 participants (10%) dropped out: eight in the On/Off sequence group and seven in the Off/On sequence group. All 153 participants were included in the analysis of the primary endpoint. Six participants were excluded from secondary analyses owing to absence of evaluable sensor data for either treatment sequence. Baseline characteristics were similar in the two groups (Table 1). After 6 months’ treatment, the mean HbA1c level was 8.04% (64.34 mmol/mol) in the Sensor On arm and 8.47% (69.08 mmol/mol) in the Sensor Off arm; the mean difference between arms was −0.43% (−4.74 mmol/mol) (95% CI −0.32%, −0.55% [−3.50, −6.01 mmol/mol]; p < 0.001). The mean difference was −0.46% (−5.0 mmol/mol) (95% CI −0.26%, −0.66% [−2.8, −7.2 mmol/mol]; p < 0.001) in paediatric participants and −0.41% (−4.4 mmol/mol) (95% CI −0.28%, −0.53% [−3.1, −5.8 mmol/mol]; p < 0.001) in adult participants. The HbA1c level decreased continuously during the 6-month Sensor On arm, and withdrawal of the sensor for the On/Off sequence resulted in glycaemic control reverting towards baseline levels during the 4-month washout period (Fig. 2). The sequence allocation and study periods had no effect on the primary endpoint in the ANOVA model (p = 0.129 and p = 0.9503, respectively). Mean sensor use was 80% (median 84%) of the required time (mean 81% over the final 4 weeks). In the paediatric group, mean sensor use was 73% (median 78%) of the required time (mean 74% over the final 4 weeks); in the adult group mean sensor use was 86% (median 89%) of the required time (mean 87% over the final 4 weeks). A total of 72% of participants used the sensor ≥70% of the required time; 24% (37 participants) >90% of the required time. The decrease in HbA1c was smaller in the group that used the sensor <70% of the required time (mean±SD: −0.24 ± 1.11% [−2.6 ± 12.1 mmol/mol]; p = 0.03) than in the group that used it ≥70% of the required time (−0.51 ± 0.07% [−5.6 ± 0.76 mmol/mol]; p < 0.001). An improvement in glycaemic control was seen across the range of HbA1c levels and age groups. For participants in the Sensor On period, no significant correlation was found between the reduction in HbA1c level and the HbA1c level at baseline (Pearson correlation -0.056; p < 0.507). The centre was significant in the ANOVA model (p < 0.0001); however, it did not modify the effect of Sensor On vs Sensor Off on HbA1c. The interaction of centre and treatment was not significant (p = 0.9306). Time spent with a sensor glucose level <3.9 mmol/l was significantly less during the Sensor On period compared with the Sensor Off period (19 vs 31 min/day, respectively; p = 0.009). In addition, significant differences in the average daily time spent in euglycaemia (3.9–10 mmol/l) and hyperglycaemia (>10 mmol/l) were observed in favour of the Sensor On arm (Table 2). The average daily glucose level was significantly lower in the Sensor On arm compared with the Sensor Off arm (8.82 vs 9.44 mmol/l; p < 0.001) and the average daily AUC for glucose levels in the euglycaemic (3.9−10 mmol/l), hypoglycaemic (<3.9 mmol/l) and hyperglycaemic (>10 mmol/l) ranges were significantly lower in the Sensor On group (Table 2). Participants in the Sensor On arm spent less time than the Sensor Off arm with glucose levels below 2.8 mmol/l (49 vs 75 min/day, respectively), although this difference was of borderline significance (p = 0.065). Glycaemic variability was significantly lower during the Sensor On period when calculated as 24 h SD of the mean glucose, but there was no significant difference when assessed by the mean amplitude of glycaemic excursions (MAGE) (Table 2). The median number of finger-stick blood glucose tests performed by the participants also decreased significantly in the Sensor On arm compared with the Sensor Off arm (4.9 vs 5.5; p < 0.001). The number of boluses/day was significantly greater during the Sensor On period than during the Sensor Off period (6.8 ± 2.5 vs 5.8 ± 1.9; p < 0.0001), while the daily total insulin dose (49.0 ± 23.4 vs 47.4 ± 22.3 U) or relative proportion of bolus insulin (52.8 ± 10.6% vs 52.5 ± 11.0%) were not significantly different between the two study periods. In addition, the number of temporary basal rates per day (0.75 ± 1.11 vs 0.26 ± 0.47; p < 0.0001), the daily use of the manual basal suspend function (0.91 ± 1.25 vs 0.70 ± 0.75; p < 0.018) and the bolus wizard calculator feature (3.82 ± 2.7 vs 3.14 ± 2.5; p < 0.0001) were significantly higher during the Sensor On than during the Sensor Off period. A total of four severe hypoglycaemic events (5.70 per 100 patient-years) occurred in the Sensor On arm and two such events (2.83 per 100 patient-years) occurred in the Sensor Off arm (p = 0.40). In addition, there was no statistical difference in the mean number of point samples (SMBG) <3.9 mmol/l (On vs Off 7.3 ± 5.5 vs 7.0 ± 5.7; p = 0.62). There was no difference in the rate of diabetic ketoacidosis between the Sensor On and the Sensor Off arms (two events vs four events; p = 0.47). A total of 178 non-serious adverse events were reported during the study periods; 80 in the Sensor On arm and 98 in the Sensor Off arm. This multicentre, randomised, controlled crossover study demonstrated a decrease in HbA1c and a concurrent reduction in time spent in hypoglycaemia, through the addition of CGM to existing CSII for 6 months in participants with type 1 diabetes. Crossover studies of longer duration are seldom used in trials evaluating diabetes-related technology. However, bias resulting from differences in education and patient–healthcare provider interactions is largely prevented by this study design. Moreover, in the present study the number of participants lost to follow-up was lower than expected and the washout period prevented any appreciable treatment carry-over. Although the studies cannot be directly compared, the significant decreases in HbA1c in both age groups in our study are not consistent with the results of the Juvenile Diabetes Research Foundation (JDRF) trial, where no change in metabolic control was demonstrated in children or adolescents using CGM . Two other randomised controlled trials directly comparing SAP to CSII alone demonstrated a significant improvement in glycaemic control in both the treatment and control groups, and the observed difference between the study groups did not attain statistical significance in the ITT analyses [13, 14]. These substantial study effects, together with dissimilarities in dropout rates, may account for the differences between the present study and those in which no significant improvement in HbA1c was demonstrated. Two recent meta-analyses of all randomised controlled trials comparing CSII with or without CGM also demonstrated a significant, albeit modest, benefit of CGM [16, 17], with a mean reduction in HbA1c that was comparable to that found in the present study. However, unlike the findings in the meta-analyses, we did not observe any relationship between baseline HbA1c levels and HbA1c reduction. Studies consistently show that sufficient sensor use is crucial to the success of CGM [6, 7, 11, 14]. In the present study, 72% of participants wore a sensor for more than 70% of the required time, which is similar to that observed in the adult cohort, but greater than that in the paediatric cohort, in the JDRF study , and similar to that observed in Sensor-augmented pump Therapy for A1c Reduction (STAR)3 . The latter study demonstrated that an increase in the frequency of sensor use from 41% to 80% was associated with a doubling of the HbA1c-lowering effect. Moreover, in the On/Off sequence there was a loss of effect following the removal of CGM during the washout period and Sensor Off arm, whereas no change in the HbA1c was observed during the washout period in the Off/On sequence. Taken together, these findings demonstrate that the efficacy of CGM depends upon its continuous use. The HbA1c decrease in this study was accompanied by improvements in several secondary endpoints, including increased time spent in normoglycaemia, decreased time in hyperglycaemia and reduced time in hypoglycaemia. A decrease in time spent in hypoglycaemia in patients with well-controlled diabetes with substantially lower mean HbA1c has been previously reported ; however, this is the first report of a concomitant decrease in HbA1c and time spent in hypoglycaemia in participants with less well controlled diabetes using CGM. As participants did not receive specific written instructions on how to use the data from CGM, it was of interest to investigate modifications of treatment patterns during the Sensor On period. More frequent insulin bolus administration along with more frequent use of temporary basal rates and manual basal suspend function could contribute to lowering HbA1c levels and reducing the time spent in hypoglycaemia. Indeed, in a large observational study with 1,041 patients on insulin pumps, lower HbA1c was associated with more frequent insulin bolus administration . With CGM, the participants also used the bolus wizard calculator feature more often. Hence, considered together, our data indicate that SAP is associated with more active self-adjustments of the insulin therapy. The frequency of SMBG values <3.9 mmol/l was not statistically different between the Sensor On and Sensor Off arms; however, significantly fewer SMBGs were performed during the Sensor On arm. The rate of severe hypoglycaemia was very low and did not significantly differ between the Sensor On and Sensor Off arms, however, this study excluded participants with a known history of severe hypoglycaemia. Similarly, the rates of severe hypoglycaemia were low in the JDRF and STAR3 trials [10, 11], and did not differ between study groups. None of these trials was powered to detect differences in severe hypoglycaemia. Potential limitations apply to this study, which may affect the generalisability of our findings. The small study effect observed during the run-in period could have persisted into the treatment periods. No common protocol was used for adjusting the therapy based on CGM or SMBG during the study, which could have lessened the effect of sensor use. However, a recent study did not show a metabolic benefit of a physician-led structured use of CGM over patient-led use . In addition, all participants had pre-existing knowledge of diabetes management. The definition of hypoglycaemia as <3.9 mmol/l was conservative. Finally, the decrease in HbA1c in the Sensor On arm did not plateau after 6 months, as observed in other trials [7, 11]. Therefore, HbA1c levels may have continued to decrease following longer treatment. By its nature, the study precluded blinding. The addition of CGM to established CSII has cost implications, and analyses are being conducted to assess the health economic impact on medical resource utilisation and direct costs. In conclusion, in both paediatric and adult participants with type 1 diabetes using CSII therapy alone, the addition of CGM resulted in an improvement in HbA1c with a concomitant decrease in time spent in hypoglycaemia. More frequent self-adjustments of insulin therapy with SAP may have contributed to these effects. The removal of CGM resulted in a loss of metabolic benefit. The SWITCH Study Group includes T. Battelino, I. Conget, B. Olsen, I. Schütz-Fuhrmann, E. Hommel, R. Hoogma, U. Schierloh, N Sulli, J. Bolinder, N. Bratina (University Children’s Hospital, Ljubljana, Slovenia), M. Gimenez (ICMDM Hospital Clínici Universitari, Barcelona, Spain), C. de Beaufort (Centre Hospitalier de Luxembourg, Luxembourg), S. Cvach (Hospital Hietzing, Vienna, Austria), L. Tarnow (Steno Diabetes Center,Gentofte, Denmark), F. Tillemans (Groene Hart Ziekenhuis, Gouda,the Netherlands) and B. Shashaj (Servizio Diabetologia, Policlinico Umberto I, Rome, Italy). The SWITCH Study Group would like to acknowledge M. Vidal (ICMDM Hospital Clínici Universitari, Barcelona, Spain), A. M. Hertz (Glostrup Hospital, Glostrup, Denmark), Y. Rayane (Centre Hospitalier de Luxembourg, Luxembourg) and I. Zupančič (University Children’s Hospital, Ljubljana, Slovenia) for clinical assistance in the conduct of the study, C. Kollman (Jaeb Center for Health Research, Tampa, FL, USA), for his review and comment on the statistical analysis plan, and H. Gough and J. Castañeda (Medtronic International Trading Sarl, Tolochenaz, Switzerland) for their support throughout the study. Writing and editorial assistance was given by N. Fisher and Springer Healthcare Ltd (London, UK), for which financial remuneration was given. T. Battelino was supported in part by the Slovenian National Research Agency Grant no. P3-0343. The study was funded by Medtronic International Trading Sarl, Tolochenaz, Switzerland. T. Battelino’s institution has received research grant support, with receipt of travel and accommodation expenses in some cases, from Abbott, Medtronic, Novo Nordisk, GluSense and Diamyd. T. Battelino received honoraria for participating on the speaker’s bureaux of Eli Lilly, Novo Nordisk, Bayer and Medtronic, and consulting fees as a member of scientific advisory boards from Bayer, LifeScan, Eli Lilly, Sanofi-Aventis and Medtronic. I. Conget has received honoraria for lectures and consulting fees as a member of scientific advisory boards from Medtronic, Bayer, GlaxoSmithKline, Eli Lilly, Novo Nordisk, Sanofi-Aventis, Novartis and MSD. B. Olsen has received honoraria for lectures from Medtronic and Novo Nordisk, and consulting fees as a member of scientific advisory boards from Novo Nordisk. I. Schütz-Fuhrmann has received honoraria for lectures and consulting fees as a member of scientific advisory boards from Eli Lilly, Novo Nordisk, Sanofi-Aventis, Bayer, Medtronic, Roche and Med Trust. E. Hommel has received consulting fees as a member of scientific advisory boards from Medtronic. R. Hoogma has received honoraria for lectures and consulting fees as a member of scientific advisory boards from Roche AG, Sanofi-Aventis and MSD. U. Schierloh received travel and accommodation reimbursement from Medtronic, Novo Nordisk, and LifeScan. N. Sulli’s Regional Diabetes Centre has received research grant support for scholarship, with receipt of travel and accommodation expenses in some cases, from Medtronic, Novo Nordisk and Roche. J. Bolinder has received honoraria for lectures from Abbott Diabetes Care, Medtronic and Sanofi-Aventis, and consulting fees as a member of scientific advisory boards from Abbott Diabetes Care, Astra Zeneca, Medtronic and MSD. All authors contributed to study design; data collection, analysis, and interpretation; reviewing the manuscript through all stages; and approving the final draft for publication.